LRN 158. San Diego Freeway, I-405. LRN 159/LRN 160. Hollywood and Laurel Canyon Freeways, Route 170. LRN 161/LRN 240. Ventura Freeway, Route 134 between I-5 and I-210. LRN 163. Venice Freeway, Route 187. LRN 165/LRN 167. Terminal Island Freeway, Route 47 and Route 103. LRN 167. Long Beach Freeway, I-710. LRN 170. San Gabriel River Freeway, I-605. LRN 172. Pomona Freeway, Route 60. 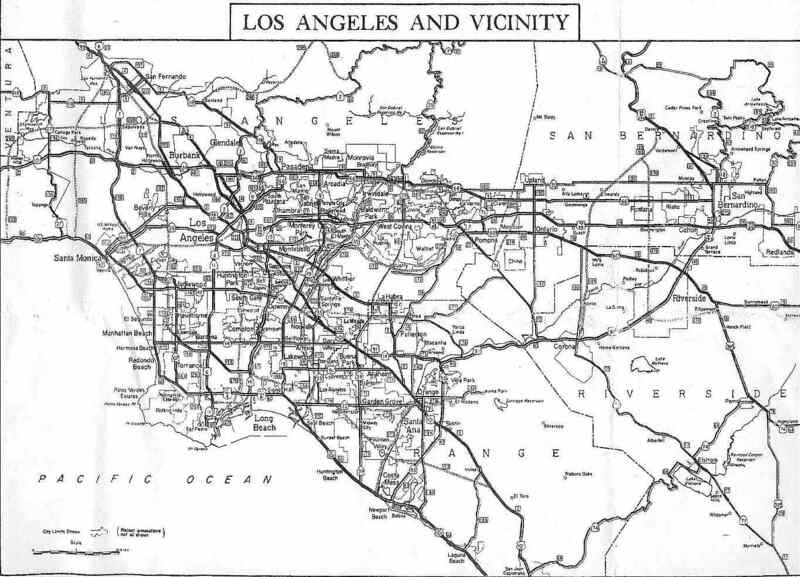 Note that before this, Route 60 ran along present-day I-10. LRN 173. Santa Monica Freeway, I-10. LRN 221. Slauson Freeway, Route 90. LRN 222. Industrial Freeway: I-110 to I-5. This segment was gone by 1965. LRN 240. Foothill Freeway, I-210. LRN 265. Whitnall Freeway, Route 64. LRN 266. 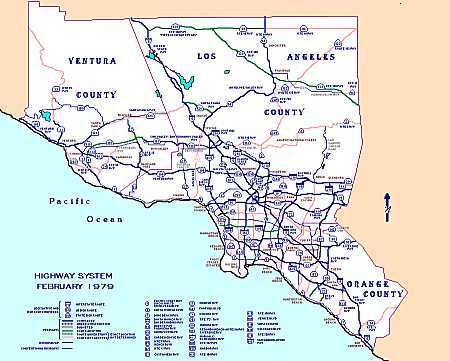 Sunland Freeway, Route 118 and Little Tujunga Expressway, Route 249. LRN 269. Part of Little Tujunga Expressway, Route 249. LRN 270. Industrial Freeway: Route 1 to I-10, Route 47. LRN 290. Reseda Freeway, Route 14 (unconstructed). LRN 291. Whitnall Freeway, but now part of Route 213. 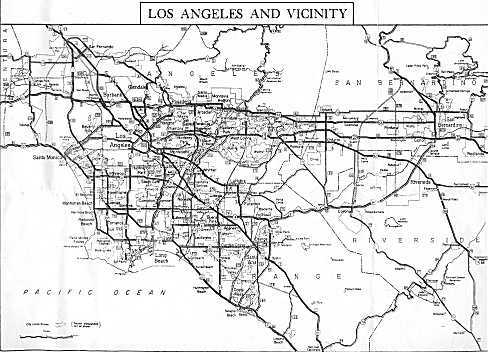 The plan continued to change and evolve, resulting in the 1965 Freeway and Expressway plan adopted by the state. This plan is illustrated in Figure 3-2. There are some differences between the 1963 plan and the 1965 plan. Most notably absent is the East By-Pass. The Venice Freeway is also gone. This map is derived from a map on page 125 of L.A. Freeway. That map was a map of the District 7 highway system published by the Public Information office of the Business and Transportation Agency. Route 14. The Reseda Freeway is now "not adopted". Route 39. 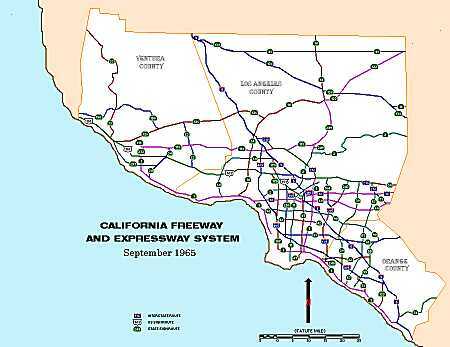 The Route 39 freeway was never adopted. Route 47. The unconstructed portion of the Industrial Freeway is now "not adopted". Although a portion is shown as "Route adopted", it will never be constructed as freeway. Route 64. The Whitnall Freeway has completely disappeared. Route 90. 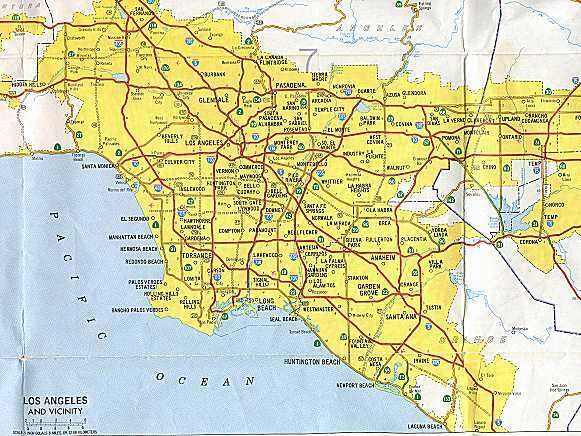 The portion between the Marina Freeway and the Yorba Linda Freeway is now "not adopted". Route 105. The Route 42 freeway has become I-105. Route 107. 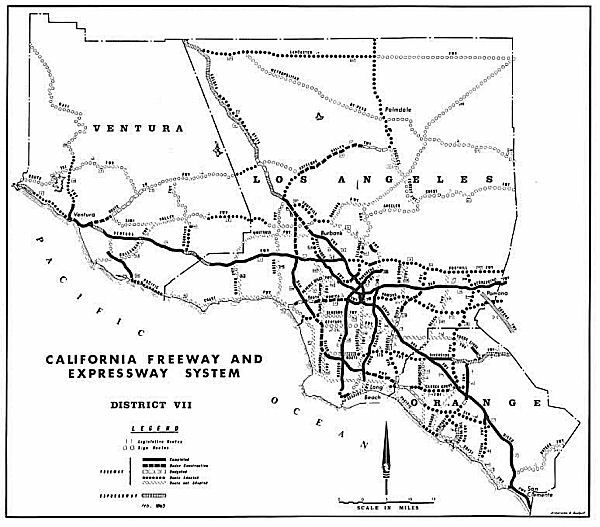 The Route 107 Freeway (Hawthorne Freeway, Pacific Parkway) was not adopted as a freeway. Route 118/249/2. All the construction along Angeles Crest was not adopted. Route 164. Shown as "not adopted"
Route 170. Only stubs remain, and the portion by the airport was not adopted. Route 258. The N/S part of the Whitnall Freeway is now "not adopted". 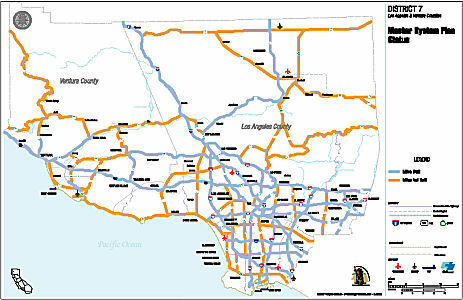 Figure 3-4 shows the Los Angeles highway system as of 1986. Routes shown with routes in open circles were never adopted. The lines with open dashes are currently under construction or construction is planned.